Since my recent posts have been rather meat-heavy (particularly with the king of all meats: bacon), I decided to post some vegetarian fare today. Honestly, if you’re going to eat something that doesn’t have meat in it, it might as well be pasta…covered in cheese. And believe it or not, in spite of all that cheese, this is actually a Weight Watchers recipe! If you’re an Italian food lover like me, it’s pretty hard to go wrong with a big plate of cheesy pasta. This meal was easy to prepare, too…well except for opening the new package of ricotta cheese. That darn plastic under the lid is impossible to get off without just stabbing it with a knife and getting it everywhere. WHY DO THEY NOT WANT YOU TO BE ABLE TO OPEN IT?! *ahem* anyways…this dish was filling and hearty even without the meat. However, I still think I would’ve preferred a little ground beef in there…but that’s just me. 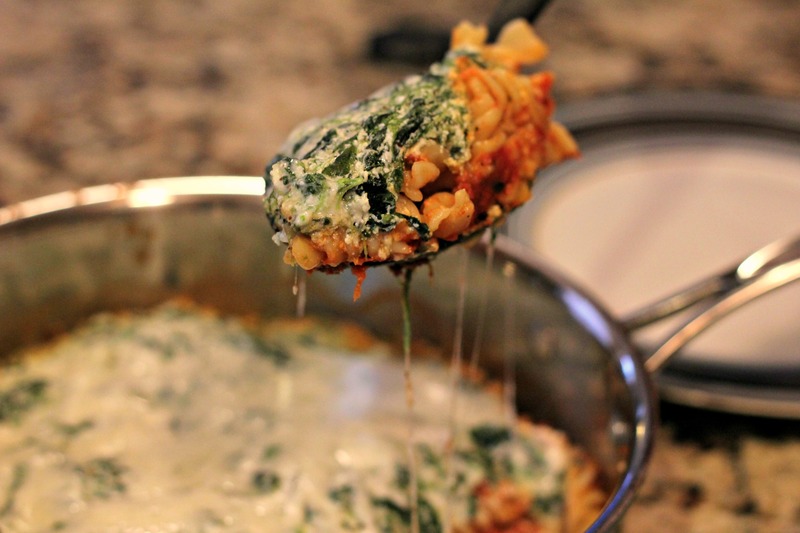 Combine egg, herbs, cottage cheese, ricotta cheese, spinach, & ¼ c mozzarella. Place ½ c of pasta sauce in a medium sprayed skillet. Add cooked pasta on top and cover with remaining ½ c of sauce. Top with cheese and herb mix. Bring to boil; reduce to simmer. Cover and cook 20 min. Top with remaining 1/4 c mozzarella cheese (I actually used a bit more than this). Return the cover and cook for 5 more minutes. My mouth is watering just looking at this…. Check out my blog! I also have some great recipes you might want to try! Thank you! I will definitely visit your site! This is sensational Lindsay! 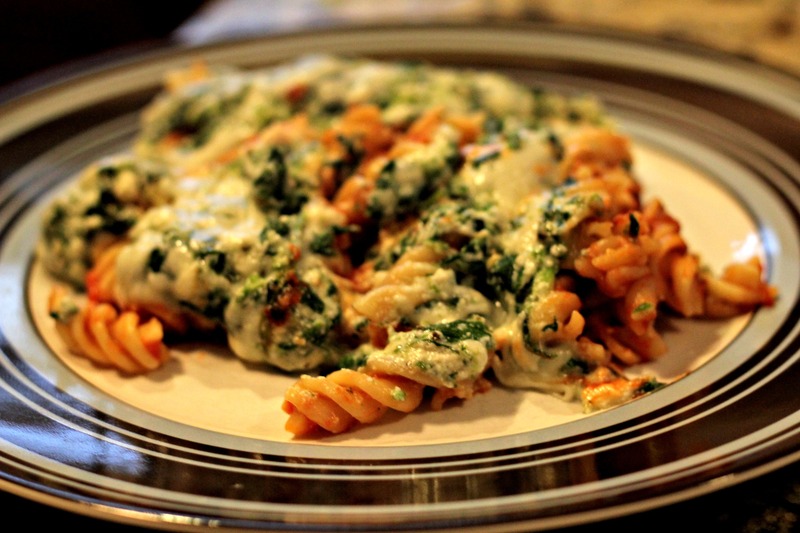 Sauce, pasta, cheeses, and spinach; yummy! Thanks Judy! It’s hard to go wrong with those 4 ingredients! It was a delicious meal for sure. After thinking about it (had it for leftovers today) I would probably even reduce the amount of cheese (and like you said add beef). Still delish though. I love being your husband. Haha thanks for the input! And I kinda used more mozzarella cheese than the recipe called for…oops But I definitely love being your wife too!